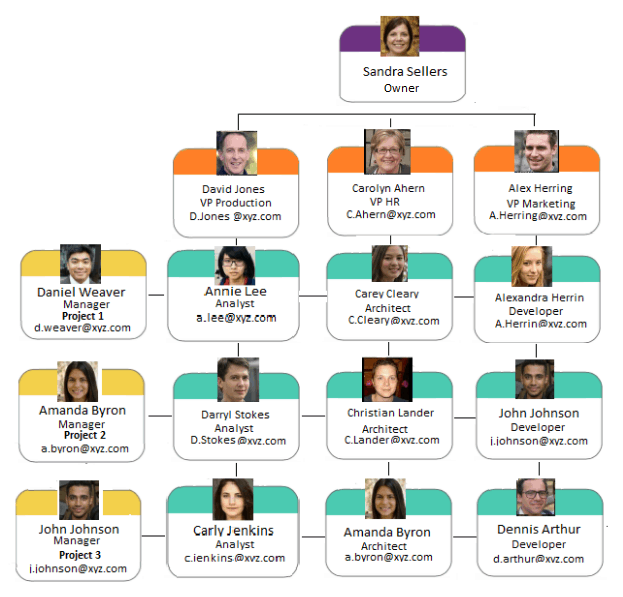 A small business organizational chart is a visual representation of your business structure. It outlines employee roles and demonstrates who employees report to within the company. There are multiple types to choose from and many reasons why you should create one for your business! Before getting started, it’s critical to establish goals for your organization chart (also known as an org chart) to help you decide which type to use and what information to include. 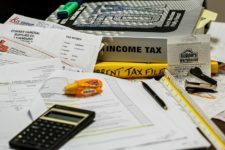 Does My Small Business Need an Organization Chart? Understanding the types of org charts available allows you to choose the one that makes the most sense for your business. 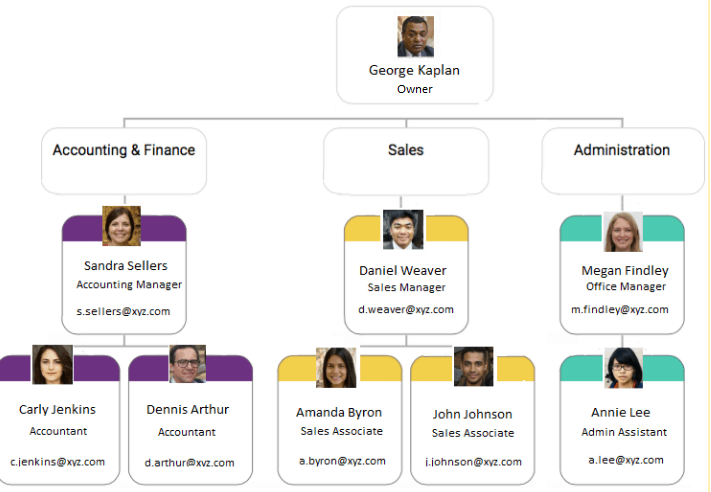 Also known as a hierarchical organizational chart or a top-down organizational chart, this is the most common structure due to its simplicity. 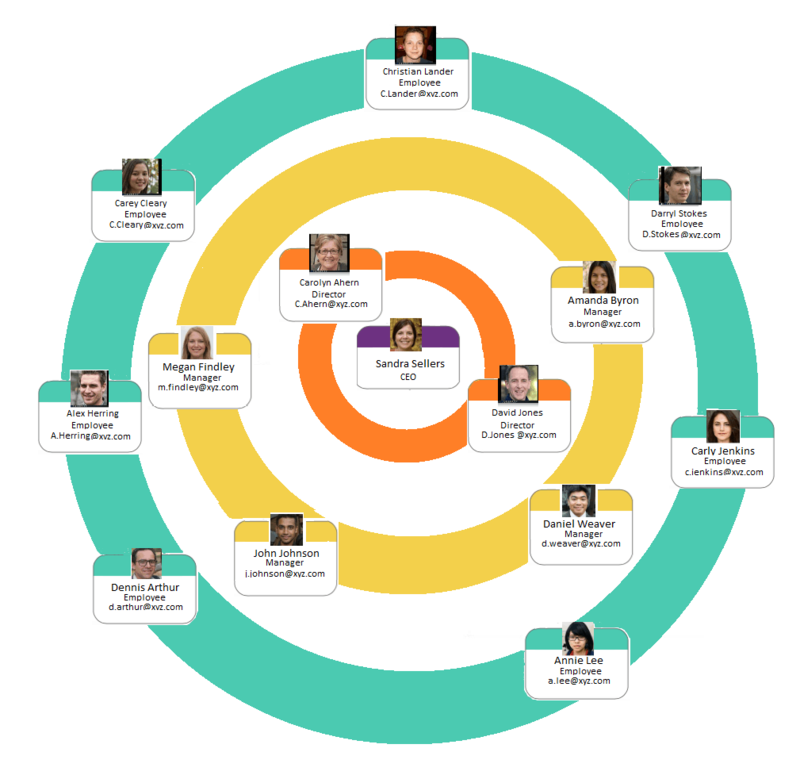 The top of the chart features the executives, then directors (for larger businesses) followed by the department heads, and the employees each department head or manager is responsible for. This traditional hierarchy is simple and rigid. Information flows through each layer of the organization in turn, and the structure doesn’t allow for collaboration between teams or “open door” access to upper management. For small businesses with few employees, this type of chart is the least complicated, with the owner at the top, shift or department managers in the middle, and other employees under them. Similar to the line organizational structure, the functional organization structure offers more lines of communication. It enables directors and managers to collaborate with one another over teams they don’t directly control, for better information flow and flexibility. In a small business, you’re likely to have separate teams with a great deal of interaction; the sales department may have daily interaction with administration and with shipping. This type of chart establishes a hierarchy in each department while allowing for cross-communication. 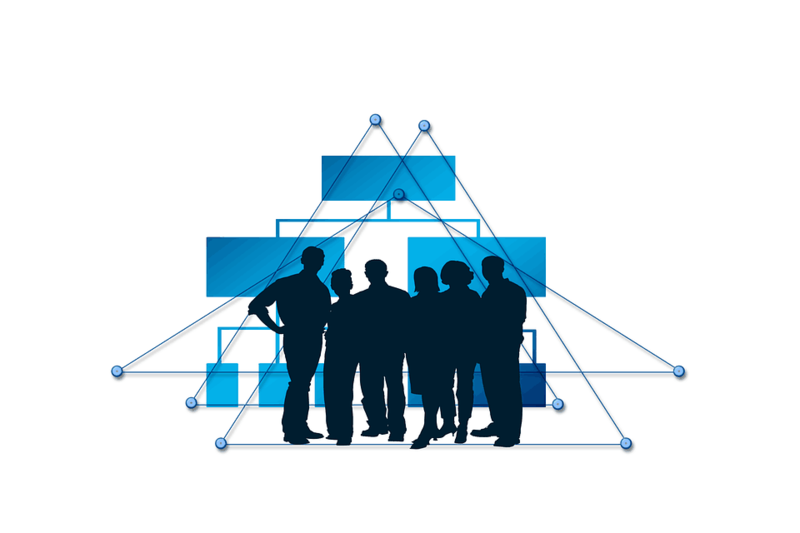 This organizational structure is best for companies working in specialist fields. The staff in this situation refers to experts advisors providing technical information, opinions, and advice, who may be allowed to authorize certain activities and assist with reports that bear weight in decision-making. Staff and line positions have different objectives and are often at odds. Conflicting expectations can be confusing for bottom-tier workers and result in lower productivity. If your business operates with projects that are different from one client to the next, and from one brief to the next, this structure is the ideal choice. The chart changes as needed for each project. 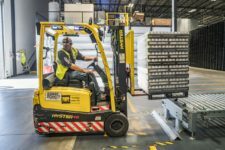 While it’s helpful to be able to mix and match personnel based on project needs, it does mean teams have to adapt to new managers and colleagues for each assignment. Managers must be able to handle a variety of functions across multiple departments. At the top, you have a director who appoints the project manager for each project. The project manager chooses a team of people to work on the project based on their skills and expertise. When the project is complete, managers and team members are assigned to other projects. For a small business, projects may internal, for example marketing campaigns or charity events. Project charts can help track teams for each initiative. The matrix organizational structure combines several types of organizational structures to create a customized solution to meet specific needs. A matrix organization is characterized by more than one chain of command, with project team members reporting to two or more managers. It’s ideal for businesses that are project-based, where teams must also follow a functional structure. In this case, team leaders are assigned a representative from each functional area that applies to the project. The functional team member reports to the project manager and the functional manager of that area. The functional manager oversees the employees and activities to ensure they’re in line with company standards and policies, while the project manager or team leader ensures the project is completed as planned. As with a line and staff structure, conflicts and confusion can arise when reporting to more than one boss. In a circular structure, there is still a reliance on hierarchy. Higher level employees occupy the inner rings of the circle and lower level employees occupy the outer rings. The executives aren’t at the top of the structure, but rather on the inside to allow ideas to spread outward. The structure is intended to promote open communication and the free flow of information between all parts of the organization. In practice, the structure is often confusing because it can be difficult for people to figure out where they fit within the organization and who they are supposed to report to. However, in a business where communication is encouraged on all levels, this allows employees to seek advice from any available supervisor, as opposed to a rigid chain of communications. First, choose the type of chart that best suits your company’s needs. To prepare for the chart creation process, make sure you have a list of all employees available with any pertinent information, such as supervisory relationships. Gathering this information ahead of time will speed the process of filling in the chart. With the type of chart in mind, choose the tool you’ll use to build the organizational chart. 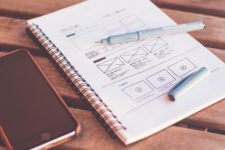 While there’s always the option of hand-diagramming your chart, this time-consuming process isn’t conducive to making quick and easy changes as your organization grows or people leave. 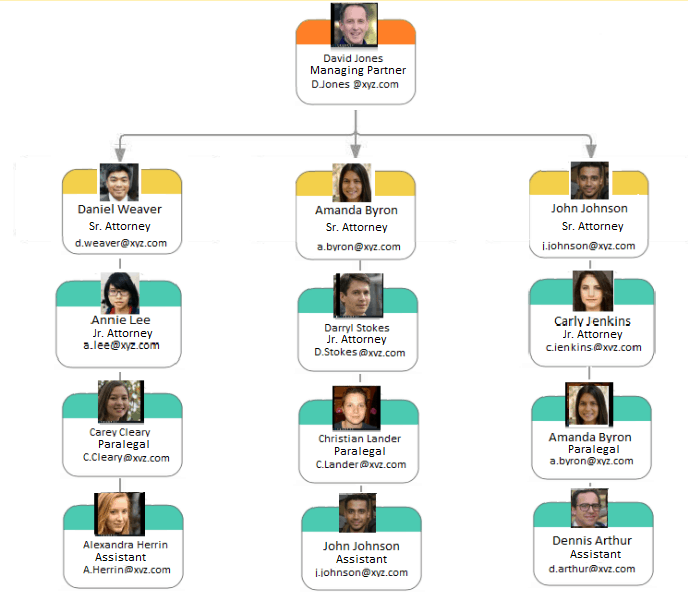 If you prefer this option, there are plenty of organizational chart templates available for download. You can use a number of free tools such as Microsoft Office or Microsoft Excel to create your chart. There’s also the option to use drawing and presentation programs such as Google Slides or Microsoft Powerpoint. 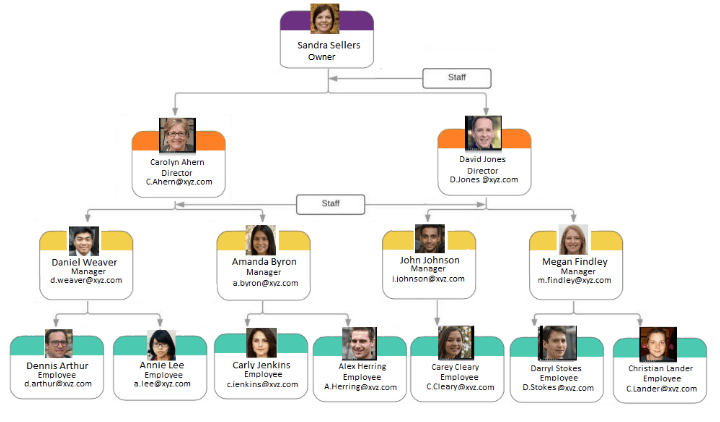 You can also use org chart software such as Pingboard to create your chart. Though it is a paid tool, there is a free version comes with limited functionality that you can use to get started. Some HR and payroll systems, including Success Factors, Zenefits, and Justworks offer the ability to generate organizational charts using the current employee data in your system. Ideally, you’ll want something that offers the ability to color code your chart, search by name or job title, and drill down to locate more detailed employee information so that it is easier to interpret, use, and update. With all the information assembled, fill in the information to complete the chart. You’ll want to at least include the name of the person in the position – leaving it blank if the position is open, along with the department, the role or job title. If there’s enough space, you can also include the location, which is particularly helpful when working with a geographically diverse or remote team. It’s also a good idea to include a photo of the person along with contact information. 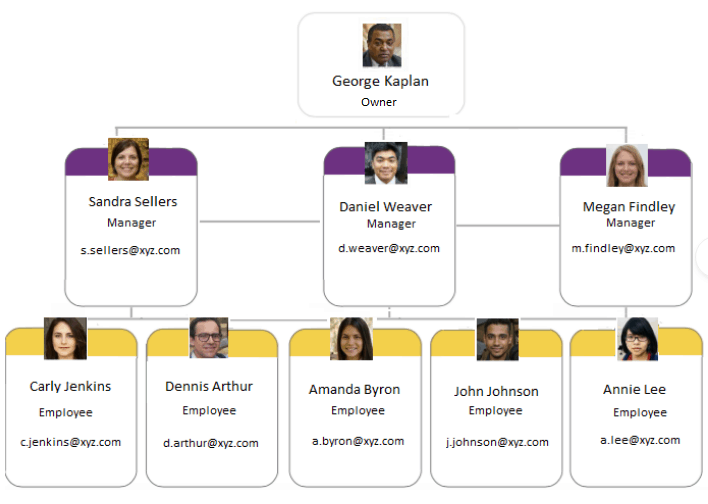 Some organizational chart software solutions offer additional functionality so that your chart can also function as an employee directory on your business website. Those options allow you to enter details that are only visible to the employee and upper management, such as emergency contacts, t-shirt size, and dietary restrictions, which can be useful for company functions and rewards. For your small business organization chart to ultimately serve its purpose and aid your business, you must be able to update your chart as needed and effectively share each version of the chart with your entire team. Access to an organizational chart facilitates daily communication among staff members and employee efficiency, contributing to smoother business operations, so it’s well worth investing resources into the process. It’s a good idea for small business owners to operate with two versions of their chart; one forward-facing for all employees to see, and one behind the scenes to plan for future growth and vacant positions.